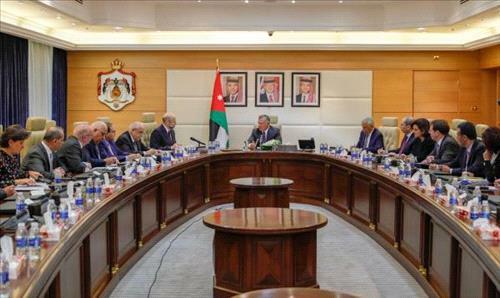 AMMONNEWS - His Majesty King Abdullah affirmed on Sunday that officials are required to serve citizens and maintain direct outreach to the public to follow up on their concerns and needs. Chairing part of a Cabinet meeting at the Prime Ministry, King Abdullah commended the government’s outreach efforts, stressing their importance and describing them as a sign of seriousness. Commenting on economic conditions, His Majesty said government cooperation with all institutions is required to address the difficult economic challenges facing Jordan. The King stressed that the government must focus on alleviating the burden on Jordanians, through coordination and field visits to keep abreast of the challenges facing the public. Affirming that Jordan will overcome challenges, His Majesty underlined that combating corruption is a key priority, expressing full support for anti-graft efforts. The King praised the government’s seriousness in dealing with the tobacco case, which involves the alleged illegal manufacturing and smuggling of cigarettes. The goal is to eradicate corruption and move ahead, His Majesty affirmed, stressing the importance of upholding the rule of law and reiterating that no one is above the law. The King also commented on the spread of rumours and character assassination, calling for cooperation and further efforts to counter these practices. Character assassination and attempts to stoke sedition are unacceptable, His Majesty underscored, stressing the importance of transparency in combating poverty, unemployment, wasta (nepotism), and corruption. The King affirmed that no one will be allowed to harm the interests of the nation and its citizens to serve some personal agendas. His Majesty commended the efforts exerted by the government since its formation, expressing full support. The King also highlighted the recent visit to the United States, which included meetings in Washington, DC, with President Donald Trump, senior US administration officials, and members of Congress, noting Jordan’s clear and steadfast position on the Palestinian cause, which is based on the two-state solution that guarantees the establishment of an independent Palestinian state with East Jerusalem as its capital. This is Jordan’s unwavering position, His Majesty underlined, stressing that there are no pressures on the Kingdom and dismissing rumours in this regard. Also at the Cabinet meeting, the King highlighted the meetings held with leading businesspeople and officials in the United States, aimed at attracting investments to Jordan and creating job opportunities. Business leaders expressed their desire to invest in and support Jordan, which they are eyeing as a regional headquarters for their companies. His Majesty said some procedures remain a challenge for investors, and this issue has been noted before, adding that work must focus on addressing this, as the priority is to combat poverty and unemployment. Prime Minister Omar Razzaz pointed out that since its formation, the government has begun to list the main themes contained in the letter of designation, stressing that his government's commitment to achieving reforms and development programs during the first 100 days of its formation. He also stressed that the government will work to implement a package of measures to stimulate the economy and provide employment opportunities. Razzaz pointed out that the government will focus on improving the quality of services, especially in the sectors of education, health and transportation. The prime minister indicated the commitment of the government to communicating with the citizens, pointing out that the government will create platforms to receive complaints and suggestions of citizens. He also affirmed the government's commitment to political reform to develop the political life, underlining the government's support for the armed forces and security agencies to maintain the security and safety of the homeland and citizens. For his part, Deputy Prime Minister and Minister of State Rajai Muasher said that, based on Royal directives to hold a national dialogue on the income tax draft law, the Ministerial Committee held meetings with all sectors to reach consensus on a strong and fair bill and achieve social justice.